Here we are going to take a look at a few examples of fitting a function to data. 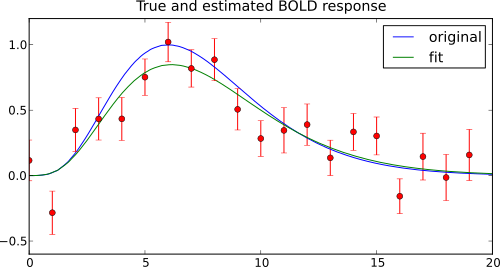 The first example shows how to fit an HRF model to noisy peristimulus time-series data. When doing a searchlight analysis one might have the idea that the resulting accuracies are actually sampled from two distributions: one causes by an actual signal source and the chance distribution. Let’s assume the these two distributions can be approximated by a Gaussian, and take a look at a toy example, how we could explore the data. First, we generate us a few searchlight accuracy maps that might have been computed in the folds of a cross-validation procedure. We generate the data from two normal distributions. The majority of datapoints comes from the chance distribution that is centered at 0.5. A fraction of the data is samples from the “signal” distribution located around 0.75. 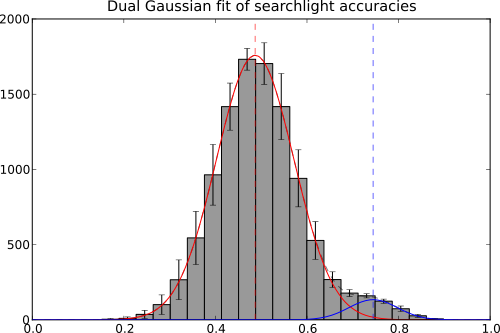 Now we bin the data into one histogram per fold and fit a dual Gaussian (the sum of two Gaussians) to the total of 10 histograms. All that is left to do is composing a figure – showing the accuracy histogram and its variation across folds, as well as the two estimated Gaussians. The full source code of this example is included in the PyMVPA source distribution (doc/examples/curvefitting.py).